Sonoluminescence is one of those strange phenomenon that many would never encounter outside an academic environment. 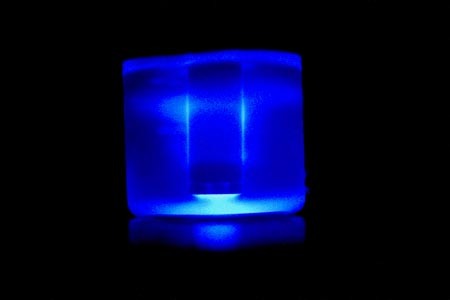 For those who have never heard of it, Sonoluminescence is when tiny bubbles suspended in a liquid emit light while being vibrated at certain frequencies. We were pleased to see that some plans are out there on how to build your own device to produce it. I did this in high school for a science fair project. Its not that hard, and pretty freeking cool. How did you “build” the experiment? My daughter finds this interesting, and I would like to help her. This is an excellent write-up. I’d be interested to know if anyone has attempted any pump-probe experiments to determine if there exists any ultrafast phenomena within these tiny bubbles. it is from the wikipedia page linked in the article. When a SASER (acoustic laser) alters the speed of the electrons in a hydrogen atom before it is combusted with a sonic vibration frequency the result is water and light. Lightning is a perfect example of sonoluminescence in reverse. @Hackius – Nein, das ist nicht korrekt. anyone tried noble gases? Neon, etc? I wonder if the abundance of Nitrogen in air causes the mini-shockwave light output to perdominately UV? can I get a chilli cheese dog with that? Hydrogen gas is combustible by sonic vibration frequency which turns it back into water and light. a little while ago i came up with an idea for “seeding” bubbles using a pulsed NUV laser, this might work..
the basic principle is fairly simple, in that the focal range can be localised to within about a millimetre of the correct point. interestingly it might be possible to make the bubbles collapse more quickly if the laser is pulsed at the correct point in the cycle, which *might* generate weak X-rays due to “braking” or bremsstralung. What we call sound is really a series of moving pressure fronts. The pressure at a fixed point swings from low to high and back as the sound wave sweeps by. If the sound is loud enough and at the right frequency, the pressure at the trough of the wave will be so low that the fluid will boil, producing microscopic bubbles. When the high pressure front at the crest of the sound wave slams into these bubbles, they implode, and shock waves focus the energy of the implosion to a central region of atomic dimensions. The temperature at that central point skyrockets above 10,000 degrees Celsius, the pressure zooms to 10,000 atmospheres and a flash of light emerges for just a few picoseconds. The bigger the bubble, the more energy in the implosion, and the hotter and brighter the sonoluminescent flash. hey I was doing a Science Research project on this and ran into the same problem as you. Since this was posted awhile ago I was wondering if you were able to figure out your setup by now and could give me some pointers?